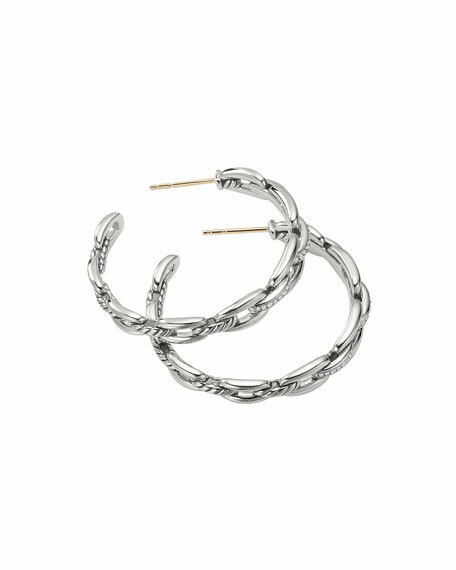 David Yurman hoop earrings from the Wellesley Collection. 0.194 total diamond carat weight. David Yurman earrings from the Ch? ?telaine Collection. Sterling silver hardware with cable huggie hoops. Diamond pav?? round drops in prong settings. 1.28 total diamond carat weight. Lever backs for pierced ears. Approx. 0.4"L drop (11mm). 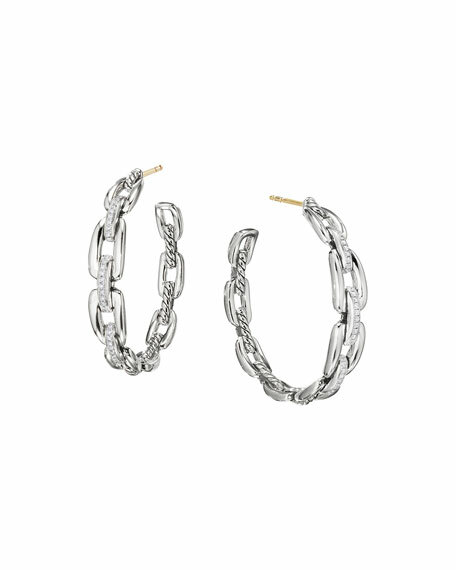 David Yurman earrings from the Continuance Collection. Polished sterling silver cable motif and pav?? settings. Diamond pav?? details with twisted hoops. 0.36 total diamond carat weight. Post backs for pierced ears. Approx. 0.7"L drop; 0.2"W.
Sterling silver and 18-karat yellow bonded gold 25mm interior diameter This item contains 18-karat bonded gold. David Yurman earrings from the DY Crossover?? Collection. Polished sterling silver settings and cable rows. Alternating cables and 18-karat yellow gold. Post backs for pierced ears. Imported.